JAKARTA, Indonesia — Indonesian authorities say at least two dozen people have died in the past day from drinking toxic bootleg liquor, raising the toll to 82 this month and highlighting how attempts to curb legal alcohol have tragically backfired. National police spokesman Setyo Wasisto said Tuesday that the latest information shows 51 died in West Java in the past several days on top of the 31 who died in the capital, Jakarta, and satellite cities earlier in the month. On Monday, the death toll was 54, based on information from police and health officials. 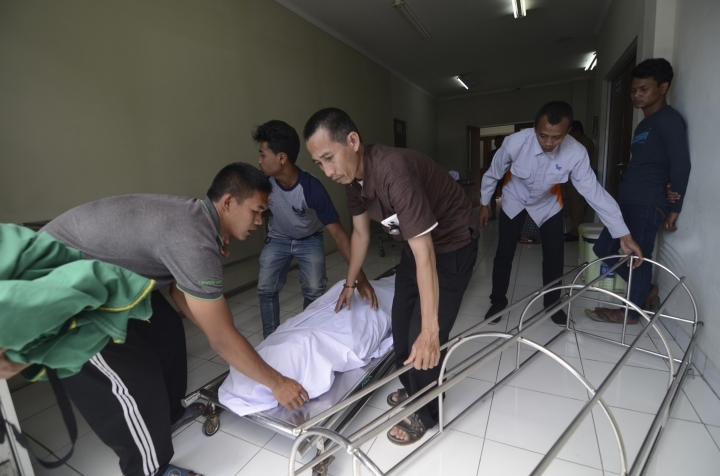 In Cicalengka, near the West Java provincial capital of Bandung, more than 90 people were hospitalized in the past few days. Elsewhere in West Java, deaths were reported in Bandung, Sukabumi and Cileunyi. "All the patients come with shortness of breath, diminished consciousness and many whose vision is blurred," Amelia, a doctor at the state-run hospital in Cicalengka who uses one name, told Indonesian TV. High taxes on alcohol have spawned a black market for booze among the poor in Indonesia, the world's most populous Muslim nation, where drinking alcohol is discouraged but not illegal. In 2015, the country banned sales of alcohol from tens of thousands of mini-marts and other small stores after pressure from conservative Muslims. The head of the state-run hospital in Cicalengka, Yani Sumpena, said it was overwhelmed with the influx of alcohol poisoning patients. "Since April 6, there are 93 patients in our hospital while our capacity is very limited, only 19 beds," he told Indonesian TV. "So the rest we refer to the surrounding hospitals." Potentially lethal methanol can be a byproduct of bootleg distilling and the tainted alcohol is also sometimes mixed with soft drinks. In the recent spate of deaths, police said pure alcohol was sometimes combined with ingredients such as cough mixture and insect repellant. Deaths from toxic alcohol are common in Indonesia and foreigners are occasionally among the victims. Some governments warn travelers to the Indonesian islands of Bali and Lombok to be cautious about consuming local spirits and alcoholic beverages. But the latest cluster of fatalities is dramatic, leading to speculation that a single large distributor was responsible. But West Java police said they have not found evidence to support that. West Java police spokesman Trunoyudo Wisnu Andiko said police have arrested seven people suspected of mixing or selling the bootleg liquor and another person remains at large. "We have not yet found any link among them," Andiko said. "Based on their confessions, they worked independently, each mixing the drinks in their own way such as using cough remedies, ointments and mosquito repellent." In the Jakarta area, police have arrested at least four suspects.